David Halpern, Institute for Government. Chapter One: Prosperity and wellbeing. Chapter Two: Not getting along. Chapter Three: The politics of virtue. Chapter Four: Fairness and Inclusion. Chapter Five: Power and Governance. 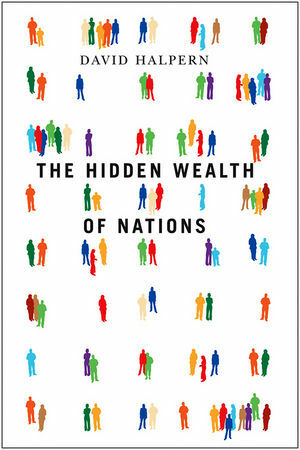 "The Hidden Wealth of Nations has a fresh idea that could catch on and transform the welfare state, while bypassing boring government machinery. The idea is that people could earn credits for caring for others. They could then use these to obtain help for themselves. The scheme could make possible a level and breadth of care that the real economy could not begin to afford. It is an idea that must be worth exploring further." "In his excellent recent book on social capital, The Hidden Wealth of Nations, David Halpern argues that (for instance) smaller class sizes for the youngest pupils and extra tuition for those that struggle are far more important than 'the building of shiny new buildings or computer rooms to impress parents'. As a former chief analyst in Tony Blair's Strategy Unit, Halpern knows of what he speaks." "Scintillating and immensely well-informed and covers almost all aspects of public policy. Halpern is particularly interested in wellbeing and - as his remarks about heroin indicate - he seems to be using the book to flesh out all the policy ideas that he could not get past the prime minister." "A collection of very interesting essays on an ambitiously broad set of topics, packed with fascinating facts and examples." "The author introduces libertarian paternalism, defaults setting, the power of declarative norms, and the choice architecture promoted by Thaler and Sunstein. That sounds heavy, but Halpern has a way to make it read like the latest Ben Elton." "Chief analyst in the prime minister's Strategy Unit between 2001 and 2007, he has written many of the most influential papers in shaping the politics of happiness. Now outside government, he expresses his confidence that within 10-15 years, 'policymakers will routinely be using sophisticated well-being measures in judgements about policy'." "Halpern has kept a wide audience in mind with this stimulating and detailed book. Kicking off with that question that everyone has an answer to - does money make you (or your nation) happy? - and romping through a range of dinner party topics from immigration to whether democracy is going down the pan, he draws out a range of evidence that is useful and often surprising." "Halpern's discussion of the policy complexity of promoting social mobility or the issues relating to overcoming social exclusion is impressively nuanced and thought provoking." "This important book... summarises the literature on life satisfaction, social capital, morality and values, and inequality, together with discussion of implications for public policy design." "An excellent book - a thoughtful and informed analysis of a wide range of policy issues by someone who's 'been there'." "An important book by someone who has been at the centre of public policy to improve our community. This book will do much to rebalance our priorities towards aspects of life which really matter."